Regardless of red states, blue states and all the madness of politics, we can all rally behind the Yellow Wave — VOTE for the Mustard Museum for the “Best of Madison”! Every year, Madison Magazine conducts its annual Best of Madison poll in hopes of honoring the very best the Madison area has to offer. We are honored to be representing the “Arts & Entertainment > Museum” category. To vote, you’ll just need to complete a simple on-the-fly registration (just super basic info, like email address, name, zip code). Voting runs through Halloween (Oct. 31). 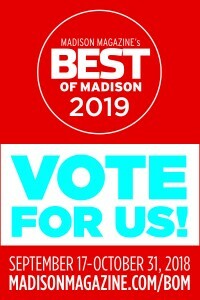 Please, consider voting for the Mustard Museum and let everyone know, we’re truly the Best of Madison! One Response to Vote for MUSTARD! Madison WI has the only mustard museum in the nation. It must bring in millions of dollars of tourism. Has to be on the Best of Madison list.